(Nanowerk News) The energy transition requires solutions for the decentralized storage of solar and wind power and the balancing of fluctuating production capacities. Centralized solutions, such as pump-storage power plants, are associated with enormous space and capital requirements. It would be easiest to store the power decentrally in batteries. Apart from the established lithium-ion batteries, the innovative redox flow battery technology is given increasing interest. Here, electrical energy is stored in liquid chemical compounds. Frequently, a vanadium electrolyte is used, which is stored in tanks in various oxidation states. Similar to the fuel cell, the current is produced at a membrane. The size of this membrane determines the power (kW), while the energy (kWh) depends on the tank size, i.e. the amount of liquid used. Hence, energy and power of the redox flow battery can be scaled independently of each other. This nearly unlimited scalability makes the redox flow battery predestined for use as a grid storage system for the energy transition, e.g. for shifting solar energy to meet consumption during the night. The redox flow battery, however, is not suited for any application. Due to the small energy density, batteries are large and heavy. Lightweight lithium-ion accumulators are much better suited for electronic devices and electric vehicles. “Thanks to its scalability, however, flow technology is superior when applied stationarily in large and medium modules,” says Professor Thomas Leibfried of KIT’s Institute of Electric Energy Systems and High-Voltage Engineering. Moreover, the vanadium used for the common accumulator is among the most abundant elements, whereas worldwide lithium resources might be exhausted in a few decades from now. Another advantage of the redox flow battery consists in the fact that it is fireproof, because a thermal runaway, i.e. uncontrolled heating, can be excluded. It is less toxic and it can be recycled contrary to the lithium-ion battery. No breakthrough of flow technology has been achieved yet. According to Leibfried, this is mainly due to the difficulty of using it efficiently. While several decades of development work have already been spent for the control of lithium-ion batteries, development of the redox flow technology still is at its very beginning. Hence, the battery still needs to be adapted to each application scenario. To change this, Thomas Leibfried and his team have developed an automatic battery management system, the prototype of which is presently being tested in a vanadium accumulator at KIT. This system ensures that the redox flow battery is always operated at the point of highest efficiency both in the charge and the discharge cycle, no matter for which purpose it is applied. Its electric efficiency is mainly determined by the pumping speed, Thomas Lüth explains. He fabricated the first prototype of the automatic management system. “If pump operation is accelerated, its internal resistance decreases. Hence, loss during energy conversion decreases as well. However, the system needs more energy for the pump.” Depending on the power needed or supplied during operation, the new battery management system finds the ideal compromise. Another important component for efficient operation is the thermal management system, because cooling also needs energy and has to take place at the right time. As soon as the prototype will have demonstrated its functionality, the battery management system will be miniaturized: The mature version will fit onto a microchip. 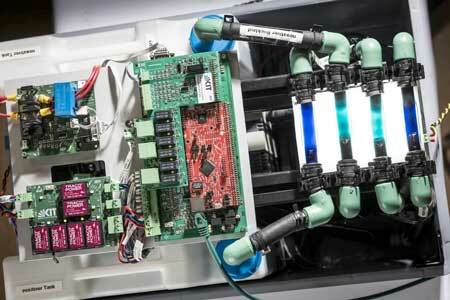 Automatic battery management is an important step to push the breakthrough of flow technology. KIT’s Institute for Applied Materials (IAM) conducts further studies. There, degradation processes of the membrane are investigated in order to optimize the materials applied. In addition, practical use of the technology is tested at KIT. A redox flow battery, including a newly designed control system, is being integrated in the “Energy Smart Home Lab” of the iZEUS (intelligent Zero Emission Urban System) project. KIT’s flow technology research is aimed at designing a new generation of efficient battery modules for mass production, which only remain to be connected at the place of installation. The battery management system for decentralized monitoring and control of redox flow batteries will be presented by KIT at the Hannover Messe, at the leading trade show “Energy” in hall 27, stand K51, from April 23 – 27.